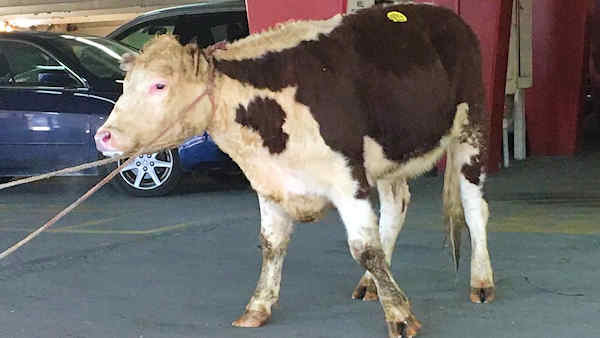 JAMAICA, Queens (WABC) -- The owner of a sanctuary went through extreme measures to save the cow that ran away from a slaughterhouse in Queens Thursday. Mike Stura with Skylands Animal Sanctuary and Rescue in Wantage, New Jersey, went to the slaughterhouse in Jamaica where the cow escaped and insisted that, given the circumstances, they should free the steer. The cow, which the sanctuary named "Freddie," escaped from Jamaica-Archer Live Poultry and Meat Market on 165th Street and started roaming the streets. The cow was captured in a parking garage a short time later. It was scheduled to be killed, as it had been ordered for an event and a deposit had been placed on it. Stura told the owner to try to convince the family that ordered the cow to take another one. The family declined another cow. So Stura waited all night for the owners to show up Friday morning, and finally convinced them to let him "give him a home and he'll live a happy life." Stura took Freddie, a male who had been neutered, to the vet Friday morning and it is now at the Sussex County sanctuary. After two weeks quarantine, the cow will settle in on 230 acres with 18 other cows.